Thursday, December 20, 2018 – Insilico Medicine, a Rockville-based company developing the end-to-end drug discovery pipeline utilizing the next generation artificial intelligence, will present its latest results in modern and next-generation AI for Drug Discovery at the PMWC Precision Medicine World Conference 2019 in San Jose, 23 of January. Aging is a complex process that has been observed in all biological systems at every level of organization. Some anti-aging interventions have demonstrated life-extending effects in model organisms. Although very good progress has been made in the area, the translation of these interventions in human clinical practice remains limited due to the absence of comprehensive aging biomarkers. Recent studies suggest that a set of biomarkers, rather than any individual biomarker, constitute the most effective means of assessing the health status. The presentation will cover the development of comprehensive and robust biomarkers of aging using deep learning and blood biochemistry, transcriptomics, and even imaging data, to be able to track the effectiveness of the various interventions we are developing. “We are happy to present our work at the PMWC Precision Medicine World Conference, which gathers the key industry leaders. 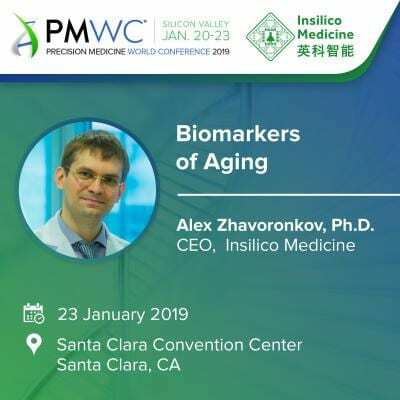 The topic of Biomarkers of Aging is rapidly gaining popularity, and we are happy to be at the leading edge of research and one of the innovation drivers in the area”, says Alex Zhavoronkov, Ph.D., Founder, and CEO of Insilico Medicine, Inc. The PMWC Precision Medicine World Conference is an independent and established conference series known as a prominent medicine conference gathering recognized leaders, top global researchers, medical professionals and innovators across healthcare and biotechnology to close the gap between different sectors and to catalyze the cross-functional collaborations. The Conference is held on 20-23 of January. Insilico Medicine is regularly publishing research papers in peer-reviewed journals. The company was first to apply the generative adversarial networks (GANs) to the generation of the new molecular structures with the specified parameters and published a seminal peer-reviewed paper submitted in June 2016. The concept was further extended and augmented with advanced memory and reinforcement learning. One of the latest papers published in the Journals of Gerontology demonstrated the application of the deep neural networks to assessing the biological age of the patients. The latestspecial issue in Molecular Pharmaceutics featured several research papers by Insilico Medicine. Insilico published an overview of its results in aging research including the development of AI aging biomarkers, target identification, cross-species comparison and geroprotector discovery in Aging Research Reviews, one of the highest-impact journals in the field.